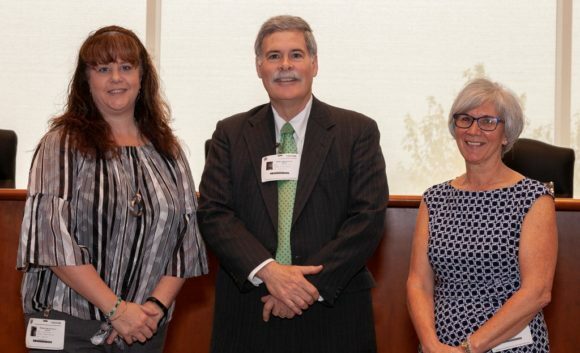 Pictured from left to right are Suisman Shapiro Paralegal Christine Gravelin, Attorney John A. Collins, III, and Paralegal Joanna Lazarus. On May 15, Attorney John A. Collins, III, was sworn in as a Judge of the Gaming Disputes Court for Mohegan Tribal Court. In its constitution, the Mohegan Tribe has given exclusive jurisdiction over any dispute involving or arising out of ’Gaming’ to the Gaming Disputes Court which consists of a Trial Court and a Court of Appeals. As used in the Mohegan Constitution, ’Gaming’ includes the development, construction, operation, promotion, financing, regulation and licensing issues, and includes jurisdiction over any associated hotel, resort or entertainment facility on Tribal lands. This jurisdiction extends to actions of Mohegan Gaming & Entertainment and disputes involving its employees and customers. The Court may exercise jurisdiction over any person who transacts any business on or affecting the Mohegan Reservation. Attorney John A. Collins, III, is a Director/Shareholder at Suisman Shapiro, who concentrates in the areas of Personal Injury Law and Civil Litigation. In addition to his role as Judge of the Gaming Disputes Court for Mohegan Tribal Court, Attorney Collins serves as the Managing Partner of Suisman Shapiro Attorneys-at-Law.